Very sad update from Eileen:- This is the story of my dog Sophie who disappeared on August 1st 2003. By sheer fluke I posted on my own page last year regarding Sophie and a friend shared the post. It was spotted by someone on her friends list who came forward to say she was the person who adopted Sophie in 2006. Sadly Sophie had died two years previous to this so I never did get to see my dog again. I did though receive a couple of photos of her in later life. A dog lover whose missing pooch was re-homed with another family has made an emotional plea to the terrier’s new owners to let her see her again. 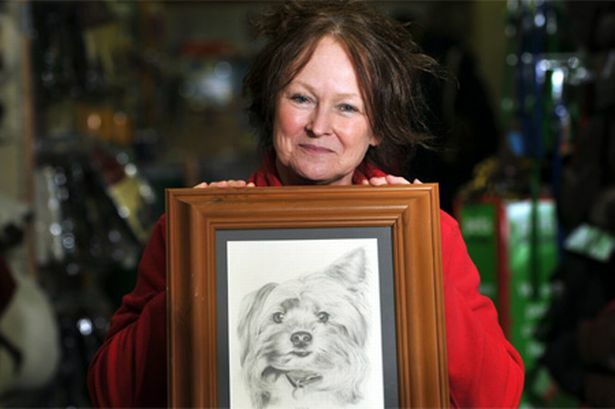 Eileen Jones has not seen Yorkshire Terrier Sophie since she escaped from her garden in the South Wales Valleys nine years ago. The 59-year-old has been left heartbroken to discover that her beloved pet was found by the Dog’s Trust – but her microchip was not checked and she was re-homed with another family, who now call her Scruffy. Eileen was so moved after Sophie disappeared on August 1, 2003, that she set up her own pet rehoming charity, Friends of the Animals RCT, and has helped give better lives to scores of animals. She has funded the charity over the last nine years with jobs including working as a cleaner and for Marks and Spencer at Culverhouse Cross. She also launched a free 24-hour lost and found helpline to offer hope to thousands of worried families. She said: “Sophie had been a gift from a work colleague. I already had Tilley, a poodle, and I was delighted that she now had a friend. “The girls often came to work with me and Sophie soon lived up to her reputation as being the naughtiest pup in the litter. “She was such a character and everyone who met her couldn’t help but love her. “She was an escapologist and on occasions managed to get out of my garden, run round to the front and wait on the doorstep – to her it was a big game. Eileen only discovered Sophie was still alive when she decided to give AVID a call three weeks ago. And to her shock, she found out the mischievous terrier had been found and re-homed in 2006 by the Dogs Trust. She claims dog rescuers scanned Sophie and found a chip, but failed to call the database and check the dog’s status. “It was a complete shock to me,” she said. “They should have called me as soon as they found her. “I had done everything right by micro-chipping her, but I have been let down by the Dogs Trust and the database company. Despite years of looking after countless other pets, Sophie was never forgotten. A spokeswoman for Friends of the Animals RCT said: “The whole situation has been a shock for all involved and Eileen’s only wish is to meet up with the dog she has spent almost nine years searching for. A spokeswoman for the Dogs Trust said: “Yorkshire Terrier Sophie was handed over to Dogs Trust Bridgend in 2005 by a gentleman, on behalf of his parents in law, who informed us that the family had acquired her as a stray. “With regret, Dogs Trust can confirm that at the time when the handover took place, we were unable to identify the dog as being reported missing. “We are in touch with Eileen Jones regarding this matter to extend our sincerest sympathies. To contact Friends of the Animals RCT please call 07570467308 or07586834999 for out-of-hours emergencies.